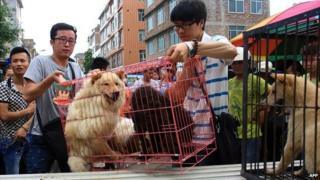 Chinese dog-meat dilemma: to eat or not to eat? The Chinese pet industry is reportedly booming - like almost everything else associated with middle-class lifestyles in this country. The veterinary and animal-grooming market is said to be worth well over $1bn (£1.7bn) a year and is predicted to grow rapidly. The latest trend? Dogs with perms that make them look like pandas. So no wonder then that the dog-eating festival due to take place in the southern city of Yulin this weekend is drawing more than a few negative comments. Have you ever seen guide-ducks or police chickens? The other thing associated with the rise of China's middle class is of course the rise of social media, with something not far off 400 million people now regularly accessing the internet via their smartphones. So those not preening their pooches have been busily tweeting. "I just want to say, have you ever seen a pig protecting its master? Have you ever seen guide-ducks or police chickens?" one asks. "When you come home, will your fish come and greet you at the door? Dogs are different." There has been opposition to the Yulin festival before, but this year for some reason, the outpouring of outrage on social media appears more intense than ever. In addition, the controversy has drawn interest from overseas newspapers and broadcasters. Of course, international animal welfare charities have long accused the dog meat trade of using cruel methods of transport and slaughter. In response, there are reports that the festival quietly opened a week early this year and that some restaurants in Yulin have taken down signs advertising dog meat on the menu. The practice of eating dogs in Asia goes back centuries. The Yulin festival falls this weekend because, apparently, some people believe that eating dog on midsummer's day brings health-giving benefits. South Korea has in recent years faced a similar debate between, on the one side, those with the new sensibilities that come with affluence and urbanisation and, on the other, those defending traditional customs in the face of globalisation. But while the practice of dog-eating lingers on, there has also long been a concern about the way the debate is framed by the outside world. Heading off on a reporting assignment to Seoul a few years back, I had lunch in London with a Korean diplomat who begged me never to do a Korean dog-meat story. He may not have liked the dog industry himself, he said, but he felt that there was a disproportionate amount of international media attention paid to the issue. A complex cultural difference was being turned it into a crude racial stereotype, the diplomat said. If there are such arguments being made in China today then they're being drowned out by the barrage of anti-dog meat opinion online. The 10,000 dogs eaten each year at the Yulin festival may pale into insignificance compared with the 1.7 million pigs that end up on dinner tables every day in China. However it seems likely that the pressure will prevail in the end. In 2011, the Chinese province of Zhejiang banned a similar festival. For now it is a topic on which the Chinese authorities are allowing the country's netizens to vent. But the issue of animal rights is one thing. There can be no social media campaign for, say, the half a million people in China that Amnesty International estimates are currently enduring punitive detention without charge or trial. Yulin's dogs may be a reminder of the extraordinary speed with which moral and social concerns can rise to nationwide prominence. But as China's middle classes grow ever larger so the Communist Party employs an ever-growing army of censors to ensure they know well the limits of their newfound voice.